Choose from a variety of floor plans in our Houston, TX, apartment community. Find your next one, two, or three bedroom apartment home and settle into life at Rock Creek. Our one bedroom apartments range from 518 square feet to a roomy 716 square feet. Our two bedroom apartments start at 851 square feet and goes up to 1,040 square feet. 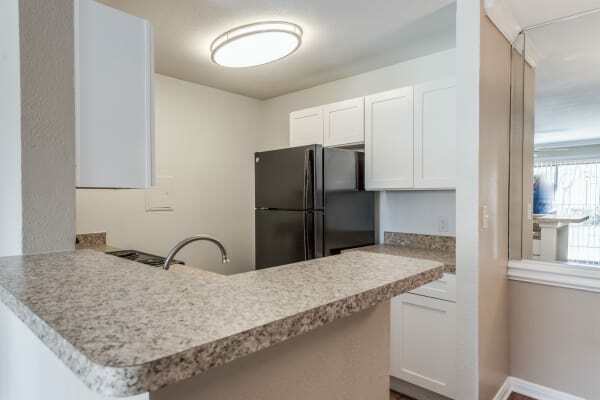 If you’re in need of even more space, check out one of our three bedroom apartments between 1,389 and 1,392 square feet. Pick a two or three bedroom floor plan with two bathrooms to accommodate your family’s morning routine. No matter the floor plan you choose, keep comfortable with in-home air conditioning, a cozy fireplace, and wood-style flooring that’s not only handsome, but easy to clean. Call today to schedule your personal tour of our affordable apartments for rent in Houston, TX.